The X1/9 Owners Club has been invited to attend the 2015 "Italian 100" event, being organised by Classic Fiat Ireland. The event will take place on the weekend 28th to 30th August 2015, in the beautiful sea side village of Strandhill in Sligo. 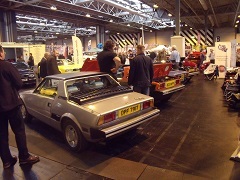 Once again the club had secured a stand at the Classic Motor Show at the NEC in Birmingham for 2014. 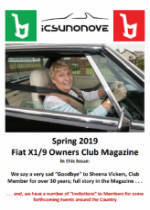 For this show, which ran between November 14th and 16th, we had Jim Freestone’s excellent modified 1300, Andrew Punter’s two tone early Bertone 1500, James Galloway’s super very early 1500 and my Gran Finale. As usual the cars generated a lot of interest and a lot of positive comments over the 3 days. Generally most of the conversations were with people who used to own them and they had rusted away, but loved the car, or they were wanting to sell or buy one. The Club now has its own Facebook page. Go here and Like it to keep up to date on all the latest Club news. 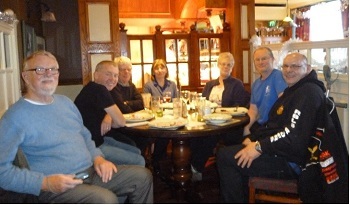 The annual Christmas lunch at the Isle of Skye hotel in Perth was once again a great success. We had 7 people attending and one X1/9. It was great to catch up with other Scottish club members in the flesh, discuss the coming year and possible events and shows we want to take part in.